Investors may be aware of the new Packaged Retail and Insurance-based Investment Products (PRIIPs) legislation, which came into effect at the beginning of the year, requiring all listed Investment Companies (ICs), including investment trusts and closed-ended funds, to produce a Key Information Document (KID). This document provides information to retail clients about the risks, costs and potential gains and losses of the investment product. Our note in January, “Are you KIDding me?” referred to industry concerns about the flaws in the new legislation and the potential for it to mislead the people it is designed to help. In this article, we try to help investors understand the changes in the disclosure of funds’ charges, and explain how they have affected the Hawksmoor Funds. It is vital that investors understand the details behind all open-ended funds’ charges when making comparisons, as the headline Ongoing Charge Figures (OCFs) can be misleading when looked at in isolation. Until this year, the industry guidelines regarded ICs as listed equities with no requirement to disclose an OCF; therefore when our Funds’ underlying (or synthetic) OCFs were calculated these ICs carried a nil cost. Now, because ICs need to produce KIDs and disclose their OCFs, the Hawksmoor Funds’ synthetic OCFs will rise. It is important to state that just because the OCF of our Funds will rise, they don’t suddenly cost more, and Hawksmoor is not earning or charging more. These tables show the breakdown of the Funds’ OCFs to highlight that it is only the synthetic OCF that has increased. As active managers, we absolutely agree with the need to be transparent with investors, as we need to demonstrate the added value we can provide above that offered by a passive solution. However, in our opinion, there are inconsistencies in these OCF calculations that are actually misleading and confusing to most retail investors. For example, we have a significant allocation in our Funds to private equity and physical property via investment trusts, which we believe are the best vehicles for accessing such illiquid asset classes due to their closed-ended structure. These asset classes provide excellent diversification benefits relative to mainstream equity and bond markets and help make our Funds truly multi-asset. However, the newly declared OCFs of these investment trusts are much higher than those of listed equity funds or open-ended property funds that do not face this new legislation until 2020. This means that our peers that only invest in these types of vehicles will not be impacted by this for another couple of years and as a result will optically look cheaper than our own funds. It is worth expanding on the previously made point that just because the disclosed OCF of investment companies will rise, and in turn so too will our Funds’ look-through OCF, neither suddenly cost more. Past performance reflects these costs that have always been in place – private equity businesses and property funds have always had to buy and sell assets and manage those to the best of their abilities to generate returns for investors and, as with all businesses, management are entitled to earn fair management fees, and sometimes performance fees if benchmarks and targets are exceeded. Therefore, just because these companies now have to report the costs involved, this doesn’t alter how we view their historic performance or dissuade us from investing in them in the future. We have shown through active management and accessing different asset classes that can only be accessed appropriately via investment trusts (sectors like private equity, property and specialist bonds) that we can enhance the prospects of attractive risk adjusted returns compared to only investing in open-ended funds. Internal analysis demonstrates that investment trusts have added considerable value over the years. 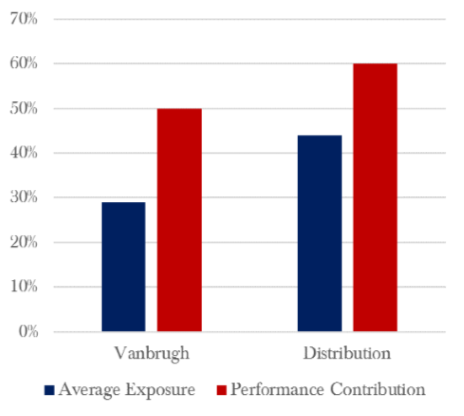 In 2017, investment trusts represented on average 29% of Vanbrugh’s portfolio yet contributed more than 50% of the return, whilst the average exposure to ICs for the Distribution Fund in 2017 was 44%, which contributed nearly 60% of the performance. Importantly, the OCF of an investment trust does not directly affect the return investors may receive, as that is dictated by the performance of its share price, which is driven by the difference between demand and supply. This can result in shares trading at a premium or a discount to its net asset value (NAV). As the costs are incurred at the NAV level, how does one calculate the true OCF of a trust that is trading at a discount? Most of the Funds’ property exposure is held via Real Estate Investment Trusts (REITs), and this makes up a significant part of their portfolios (8% for Vanbrugh and 13% for Distribution). Peculiarly, the PRIIPs regulation does not apply to REITs and therefore they have no requirement to produce a KID, even though the majority do, and there is no requirement for the disclosed OCF to be included in the Funds’ synthetic OCF calculation. If this legislation was to change in the future, we would see a further hike in our presented OCF, but of course, the charges are already reflected in the portfolios, via the performance of the trusts, and it would not make our Funds more expensive. Furthermore, different investment companies are interpreting the legislation differently, and some are uncertain about which costs should be included in the ‘composition of costs’ table on the KID, and in which category. For example, one of our investment trust holdings began the year with an OCF of 9% but, further to the annual review held in consultation with legal experts, has changed the costs that are included in each category and now shows an OCF of 0%. There is every chance that other investment companies will change the methodology used for calculating these costs presented in the KIDs so it may be a couple of years before a consistent application of the regulation is adopted. This highlights that there is widespread confusion and suggests that perhaps the rules have been brought in too hastily. Despite the illusion of higher costs on our own Funds compared to passive solutions or funds that only invest in open-ended funds, we will continue to strive to demonstrate the added value investment trusts offer, in terms of investment opportunities and diversification benefits, and endeavour to produce superior risk adjusted returns for our investors. We hope that the regulators’ obsession with costs will not hinder the true objective of any investor; to maximise real returns after charges and taxes. This financial promotion is issued by Hawksmoor Fund Managers which is a trading name of Hawksmoor Investment Management (“Hawksmoor”). Hawksmoor is authorised and regulated by the Financial Conduct Authority. Hawksmoor’s registered office is 2nd Floor Stratus House, Emperor Way, Exeter Business Park, Exeter, Devon EX1 3QS. Company Number: 6307442. This document does not constitute an offer or invitation to any person, nor should its content be interpreted as investment or tax advice for which you should consult your financial adviser and/or accountant. The information and opinions it contains have been compiled or arrived at from sources believed to be reliable at the time and are given in good faith, but no representation is made as to their accuracy, completeness or correctness. Any opinion expressed in this document, whether in general or both on the performance of individual securities and in a wider economic context, represents the views of Hawksmoor at the time of preparation. They are subject to change. 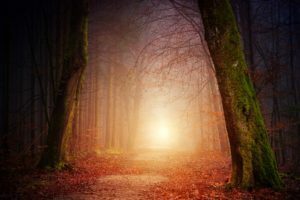 Past performance is not a guide to future performance. The value of an investment and any income from it can fall as well as rise as a result of market and currency fluctuations. You may not get back the amount you originally invested. HA2438.